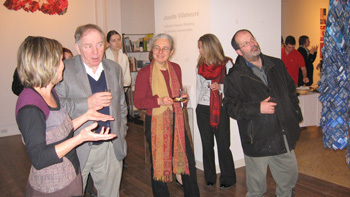 Josette Villeneuve à la Galerie Glendon (Université York), Toronto (Ontario). 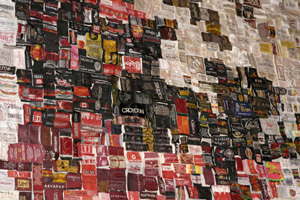 A fascination for textiles, textures, and where they were made – these were the initial motivations of Quebec artist Josette Villeneuve for collecting labels of used clothing. But the works she created from these mundane sources, currently on view at the Glendon Gallery with the title Un monde à raccommoder /A World in Need of Mending, are anything but commonplace, as they are full of colour, symbolism and imagination. Josette Villeneuve in front of the Map of the World“I discovered an interest in clothing labels in 2003”, says Villeneuve. “Their textures and exotic origins seduced me and filled me with questions about their geographic and social context. Where were they made, by whom, under what conditions?” Since each label features the location of its production, the ‘made in…’, collecting them was also a means of virtual travelling and understanding the impact of globalization.Villeneuve initially collected by sorting through unwanted, unsalable items at used-clothing depots, and personally removed each label. Eventually, places like the Salvation Army Store and other collection sites started setting bags of clothing aside for her and occasionally even removed labels they thought would interest her. “The more I collected, the more I wanted”, she confesses. 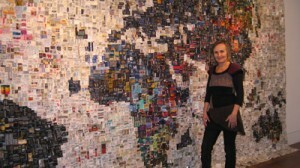 The flags of Canada and VietnamHer first wish was to produce a really large work – a map of the world, stitched together from tiny pieces that came from every corner of the globe. 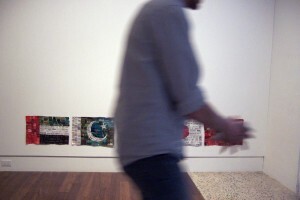 Putting fifteen of her creations on view, the current exhibition includes this seminal piece, an enormous 9-foot by 17-foot testimonial to Villeneuve’s patience and attention to detail, as each tiny piece has been pinned individually to the backdrop.Villeneuve started with representative items: maps, flags of different countries. But her impish sense of fun took over as she created an American flag which contained Cuban and Thai labels – from products which would never have found their way to American stores.Her map of the world dominates the current exhibition, directly opposite the entrance to the Gallery. There are also a number of recognizable flags on display including India’s, Vietnam’s and Canada’s. But soon Villeneuve’s imagination took over. With a wink to Neo-Dadaist American artist Jasper Johns, whose best-known works include flags and maps playfully reconstructed with unorthodox colours and characteristics, Villeneuve’s flags gradually took on new features as well. “I realized that when you look at real flags on display, what you also see is the sky and the clouds above. So, I decided to incorporate these into my works – after all, a creative artist can do anything”, she twinkles. In fact, she considers clouds as a metaphor for continued transformation, a cyclical change much like what happens within the world’s population. What resulted from her fascination with clouds is a series of cloud-flags – flags that started out as accurate representations of the official ones, but which were transformed into cloud shapes with details such as stars or stripes in other colours than the official ones. The most impressive cloud-flag on display at Glendon is the large blue one which is the first work greeting visitors as they enter. With its sapphire blue background and dreamy white cloud centre, it transports the onlooker up, up into the sky. 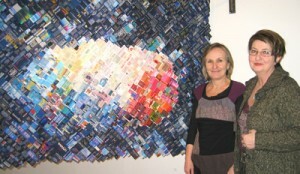 Un monde à raccommoder – A World in Need of Mending is shown at the Glendon Gallery until March 21st. The next exhibition at the Gallery will display the work of York University Masters of Fine Arts studentStephanie Reynolds, from April 18th to April 30th. For details and gallery hours, please visit the Gallery’s website.